I had the extreme pleasure of enjoying some superb Burgundies over the weekend. I am on record as being pretty parochial when it comes to Victorian Pinot but not to the extent that I don't dream of being able to enjoy French Burgundy much more often that I actually do. We visited some friends for dinner the other night for an amazing Thai feast, for some reason I didn't feel it was appropriate to blog about someone else's cooking (unless I'm paying for it) so regrettably I didn't take any photos. As well as being an excellent cook, my friend is a very experienced sommelier we were lucky enough to enjoy an impromptu Burgundy tasting with a wonderful explanation of some of the finer points of tasting and Burgundy in general. I was in heaven! 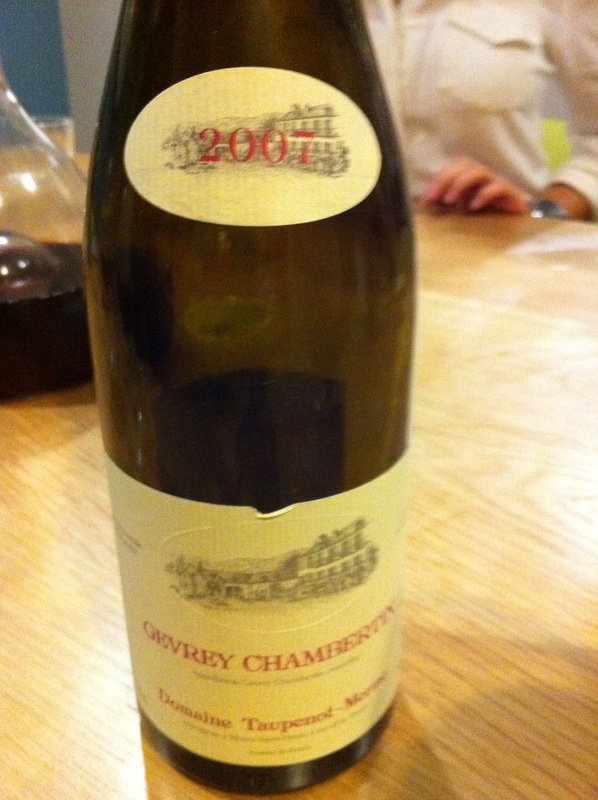 First up was a Gevrey Chambertin 2004 Premier Crus Bel Air. I learned that Burgundy as an area is classified into different areas and each area receives a designation from the monks. The highest designation is Grand Crus, next is Premier Crus then Village. Now I'm pretty sure I have never enjoyed a Grand Crus but now that I know about it, its right up there on my must try list. I think I may need to do a bit of saving first though as I imagine Grand Crus is not cheap. I took my first taste of the 'Premier Crus' and swilled and swished and rolled my eyes back in my head trying to match the gorgeous sensations I was experiencing to some kind of description but nothing came... Now I did get a bit of help at that point and definitely leaned more about acid and tannins than I hadn't previously understood. In particular, I'm pretty sure I now understand 'tightness' which is not necessarily a desirable characteristic but the other end of the scale is 'flabby' which you don't want either. The Gevrey Chambertin 2007 Premier Crus was right in the middle of course. I think the wiki decrsiption sums up 'tightness' pretty well. A wine with a significant presence of tannins that is restraining the other qualities of the wine, such as fruit and extract, from being more noticeable. Next we moved onto the Gevrey Chambertin Bel Air 'Village' which is the next designation down from the 'Premier Crus'. I was shown these two vineyards (Bel Air Premier Crus and Bel Air Village) on a detailed map of Burgundy vineyards and was quite surprised to see how small each vineyard was and also also how close they were to each other. From my somewhat mottled memory that evening I'm pretty sure both of these vineyards were each only the size of a few football fields and they abutted each other. Despite the almost identical location, I could definitely taste a marked difference between the two wines. The 'Village' had a lot less nose and also noticeably a little tighter. I felt that the best way to identify the tightness was to allow the wine to roll off the sides of the tongue and see how quickly and smoothly the acid dissipated into my mouth. The tighter wine didn't dissipate as smoothly and left a bit of acid tightness right in the centre of the tongue. Needless to say it was also a wonderful drinking experience and markedly different from the Victorian Pinot that I normally drink. I'm not going to say that the Burgundy was better than the Victorian Pinot, its a matter of personal taste but I will definitely admit that the Burgundies were far more refined and probably less fruit heavy. As with most times when I am asked to compare food or wine I have to take the easy option, I love them all! 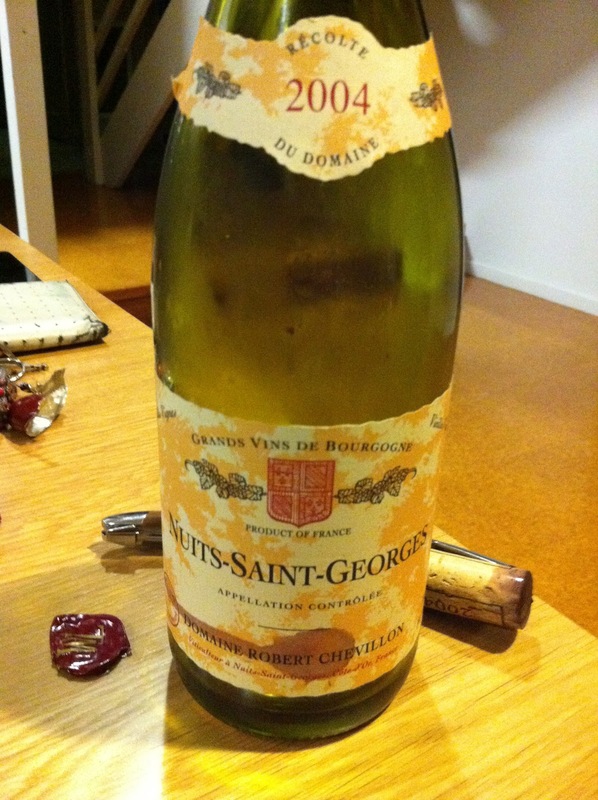 We finished with the Nuits Saint George 2004 'Village'. By this time I was probably not in the best state to be doing comparing and was actually getting my glasses mixed up and it didn't really matter to me. I was just like a little kid at a party with lots of bowls of lollies in front of me grabbing from each bowl and having a great time. From memory the Nuits Saint George was quite similar to the Gevrey Chambertin 'Village' although the year was 2004 versus 2007. My more experienced drinking partner that night did point out some of the differences which I'm sure I noticed at the time but cannot remember well enough to repeat them here... Such a great night! In my defence we also polished off two bottles of Champagne before we even started on the Burgundies and as our hosts are both from the hospitality industry they have a skill of subtly refilling your glass misleading you into thinking you are still on that first glass. That is, until you walk into the flyscreen door! Did I mention I had a great night!! !